The CMS6000 is a high quality patient monitor with a complete range of measuring possibilities. 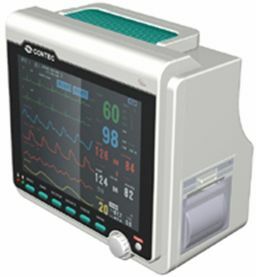 CMS6000 has an 8.4 inch TFT colour display and is adapted for bedside monitoring of adults, children and neonates. CMS6000's standard configuration allows monitoring of ECG, NIBP and saturation. Optionally CMS6000 offers monitoring of respiration, temperature, invasive blood pressure and EtCO2. CMS6000 can also be put in a network and offers the possibility to print out data.